Every winter and spring we go out to the Florence area to go hunting. 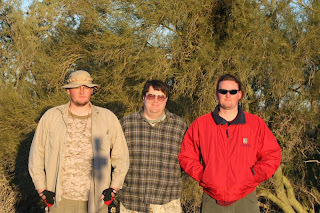 This is a picture of my brother s Chris, Robert, and me. We've gone hunting for at least 6 years, sometimes we get a rabbit or a hare and sometimes we do not. Every once and awhile some of us get jealous (Chris mostly) of the other and go for the next best thing, like ground squirrels or sparrows. After years of good to great hunting, with some of us thinking one will shot the other. 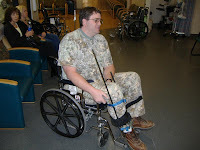 My brother Robert had to go and break his leg instead and mess up one year of hunting. All other times we have fun killing the wabbits. 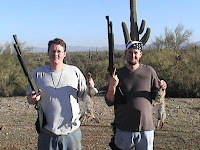 This is two of the jackrabbits I got. This is some of the rabbits and ground squirrels (Chris had to shoot to make up for not getting anything that hunting trip) we got. Here is one rabbit that Chris and I got together and a jackrabbit Chris got. This one of the breaks we had during hunting and a picture of Robert in the ER after he broke his leg. Lets just say almost everyone at the hospital came to see the splint we used (to know what we used, visit the link Men Hardly Working). Mike is the one who gets jealous of all my rabbits.